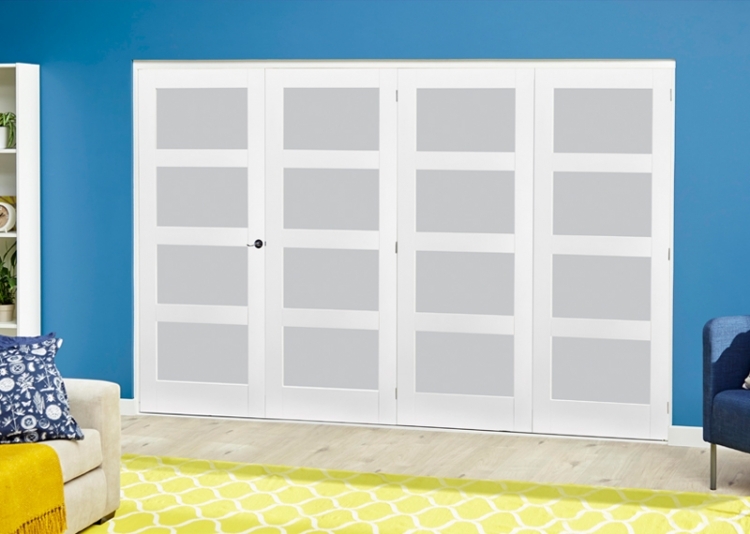 These solid white primed shaker 4L glazed internal Roomfold Deluxe doors from CLIMADOOR are supplied in a high quality white primed finish with frosted toughened glass pattern for that contemporary look. Available in 3, 4 5 and 6 door systems, using 533mm, 610mm 686mm and 762mm internal doors you ensure that installation is made simple with no planing of doors on site and a simple installation routine to follow to assemble the doors and frame in the opening. Joiner recommended. To decide on the best solution of which interior folding doors are for you, take time to review the opening sizes and product sizes available before selecting the option to buy.